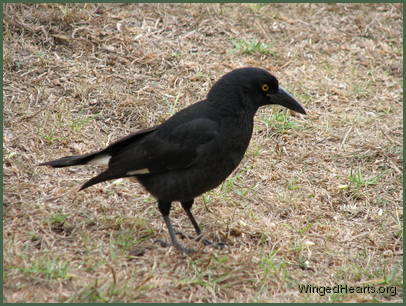 Currawongs tend to lead nomadic lives. They are very good at hiding in the dark shadows in a tree and are hard to spot, even though you have seen them go in and know exactly where to look. 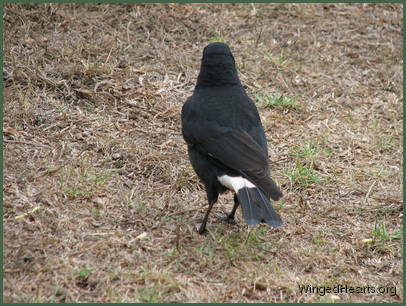 They are big and sneaky looking birds, but actually quite shy and surprisingly timid. 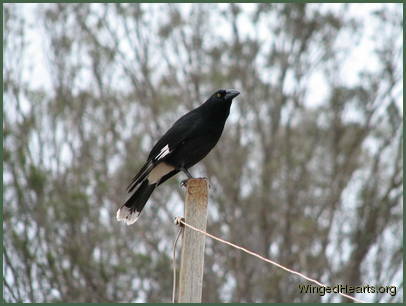 Even juvenile magpies and pied-butcherbirds can boss them around quite easily. 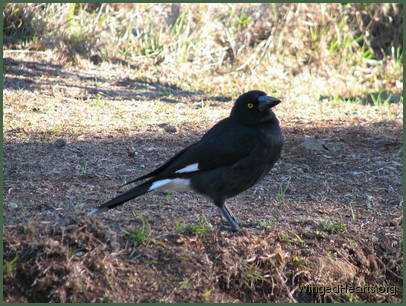 All our youngsters of both species, (especially Dimpy the pied-butcherbird), have delighted in bossing the currawongs. This is a picture of Karitu (left), who grew up in our yard. Karivon his twin looks very identical. On their annual migration to the South a big flock of White Cockatoos fly over our region each year. They like to stop in the trees for a rest. 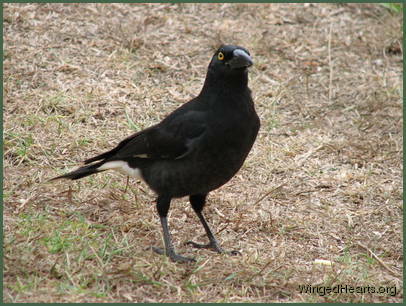 The Currawongs get most upset on seeing them. This is one time when they all come out of hiding and collectively chase the cockatoos. 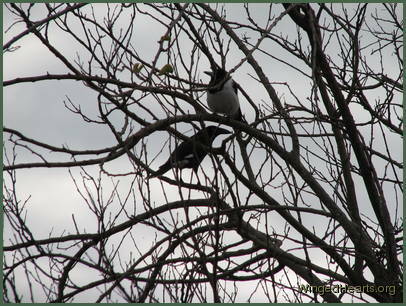 Part of the currawong action is to "show and tell" the cockatoos that the trees are already occupied by them and so not available for the taking. I would love to see more of the cockatoos. But they don’t get to spend much time in the trees on these occasions and the whole visit lasts for no more than twenty minutes. From their interaction during this time, it appears as if the Cockatoos and Currawongs probably compete for the same types of food in the bush and like to inhabit the same parts of the trees. Currawongs have such big beaks and can eat by the shovel load, given half a chance so I always ask them to wait till later. Most of the time they listen to us without any problems, and wait when we tell them to, so that the smaller birds get a chance to feed. 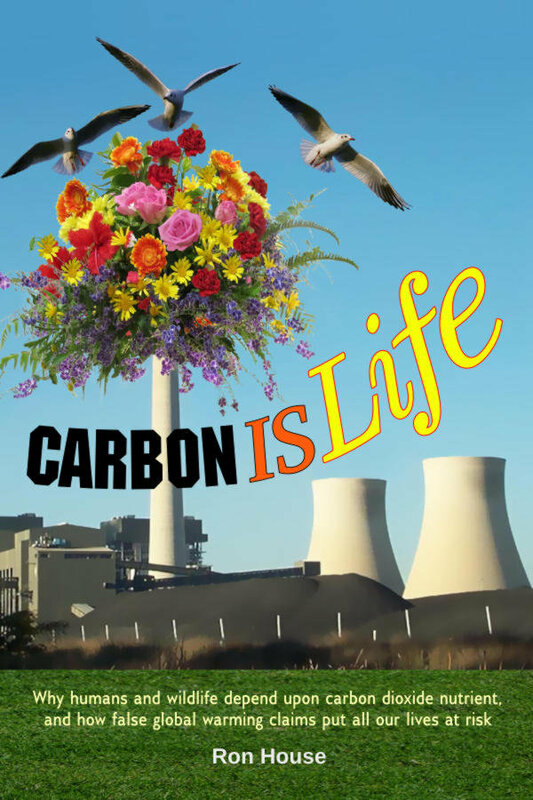 The magpies and currawongs are good friends.